On Monday, January 16, in addition to contributing to TPS's Day of Service project, many families from TPS took part in the MLK DARE March in Center City. The March, while spirited, was conducted in a manner to support people with children, and there were many young people throughout the crowd. 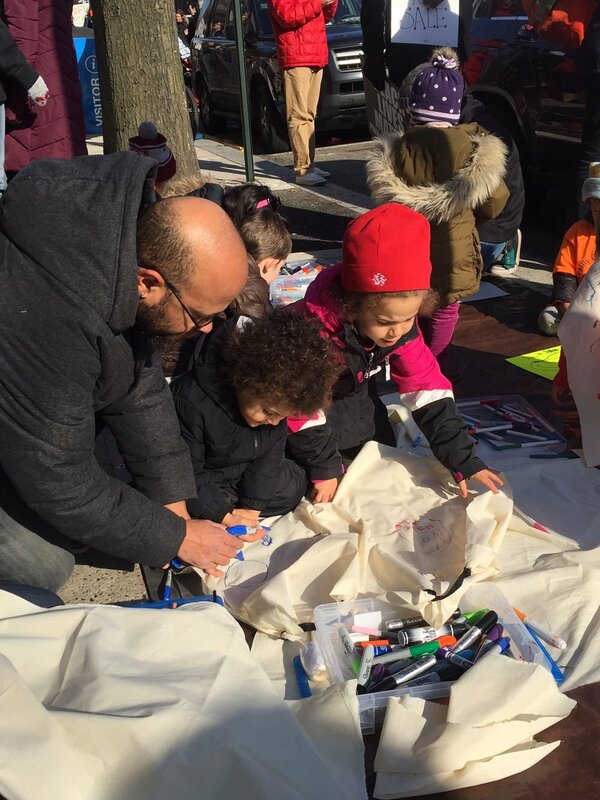 One thing that some TPS families, who are also members of a families for racial justice group called Philly Children's March (phillychildrensmarch.org), helped with was a children’s area both at the beginning and the ending of the march. Before the March, kids got BLM balloons, made their own unique signs, and most distinctly created capes with various justice oriented messages on them. The capes were the biggest hits, and could be spotted flowing everywhere. After the March, children chalked the playground with messages of love and tolerance and resistance, wrote letters to support various groups, and to Mayor Kenney and made even more capes. Itzy W. & Violet G-W from Primary C decided to interview people during the rally about what they could do to make the world a better place and are thinking about how to help organize people to realize their vision of a better world. It was great to see lots of TPS families marching together, or seeing each other across the crowd rising up for justice. Having fun and thematic things for young people to do enabled a lot of families to stay longer than they might ordinarily do; I know our kids had a blast, which left us able to catch the riveting speeches, poetry, and atmosphere. This included a powerful poem by the legendary Sonia Sanchez. And a lucky TPS third grader, Miriam A., even got to spend some time behind the scenes with this wise woman that afternoon! Many TPS families attended Tuesday evening's informative and inspiring Progressive Talk with Ali Michael.. The handout from that discussion is full of practical steps white parents can take when talking to their white children about racel and building a positive racial identity (the focus of this particular talk). That handout (as well as many others from Progressive Talks this academic year) are available for download from the TPSA Page through the Parent Portal-password "tigers" on the TPS website. Look for more followup and additional resources related to this week's talk from the FDC in a future blog post. Lastly, building on the inspiration from the MLK DARE March and the Progressive Talk this week, FDC would like the TPS community to know about the The Black Lives Matter week for Philadelphia schools beginning January 23 that is being organized by the Caucus of Working Educator’s Racial Justice Committee. The purpose of the week is girded in the 13 guiding principles that extend Black Lives Matter into a movement. While TPS is not participating in an organized, official fashion school-wide, we invite individual students, parents, and teachers to explore the resources the group is providing whether for next week, next month, or throughout the year, for either in the classroom or in one's home discussions and actions. There are also several public forums happening in conjunction with this effort that many may find interesting.